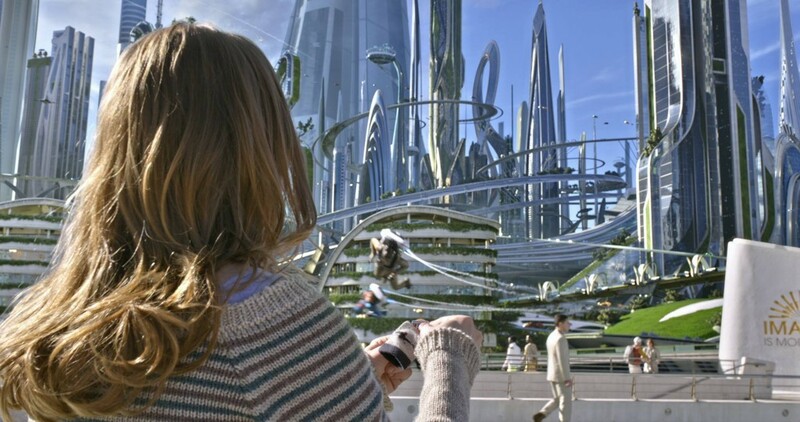 ‘Tomorrowland‘ comes with a stunning 1080p HD transfer and is presented in 2.20:1 aspect ratio. This really couldn’t look any better. This image is demo worthy for sure to show your friends and family, which should wow them into thinking you have the most amazing audio/visual setup. Detail is very vivid and sharp at all times. Closeups reveal every individual hair on Clooney’s face, every makeup blemish, wound, and wrinkle on each actor. Closeups also show the excellent textures in the wardrobe as well, down to the amazing detail on all of the futuristic gadgets and buildings. It’s quite astonishing. Wider shots never go soft either, still providing a great amount of detail in background items and characters. Colors are simply vibrant and bold, popping off screen whenever they get a chance. Each color is well-balanced and saturated, to give the most realistic look to the image. Black levels are always deep and inky and the skin tones are natural. There are no issues with banding, aliasing, or any other problem that I noticed, however there is a very tiny amount of video noise here and there, but to the untrained eye, this video presentation looks perfect, which it is. This release comes with an excellent lossless DTS-HD MA 7.1 mix and it just sounds incredible. This fully immersive track puts you into the center of both the present world and the future world at all times. You might be looking over your couch or chair to see if there is anything behind you. Sound effects are robust, full, and loud, delivering a very dynamic soundscape to this film. There is some excellent directionality with each noise as well. The surround speakers also get quite the workout as well, with tons of ambient noises to fill the sound scape. The heavier action scenes, including gunshots and explosions pack a punch with each sound being well layered and balanced for that perfect sound that never overlaps itself. The score is phenomenal as well and never drowns out any of the dialogue. Speaking of the dialogue, it’s always crystal clear and easy to follow, and free of any pops, cracks, hiss, or high shrills. The bass has a great rumble to it as well and never crosses into rocky territory. The LFE is excellent here and the dynamic range is very wide, leaving this audio presentation with excellent marks. Remembering the Future: A Personal Journey Through ‘Tomorrowland’ with Brad Bird (HD, 8 Mins.) – Here we have director Brad Bird discussing the history of Disney and its ‘Tomorrowland’ park, along with similarities to today’s technology. The cast and crew show up here as well. 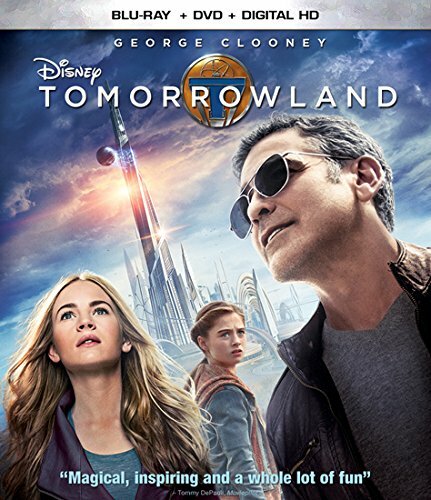 Casting ‘Tomorrowland (HD, 8 Mins.) – This is a look at the casting process for the film and the characters the actors played. A Great Big Beautiful Scoring Session (HD, 6 Mins.) – Composer Micahel Giacchino discusses his work on the film and recording the music for the movie. The World of Tomorrow Science Hour (HD, 5 Mins.) – Not really an hour, but this is hosted by futurologist David Nix, but acts as a gag reel from a 1965 educational program from Disney’s ‘Tomorrowland’ park. Animated Short: The Origins of Plus Ultra (HD, 4 Mins.) – You can play this before the film if you want, or catch this extra, but this is an unknown short film that tries to explain a secret organization called ‘Plus Ultra’. Weird. Brad Bird Production Diaries (HD, 5 Mins.) – This two part feature has Brad Bird taking us through the sets that were created for the film. Blast from the Past Commercial (HD, 1 Min.) – That fun comic store in the movie has a commercial. Here it is. Deleted Scenes (HD, 24 Mins.) – There are six deleted scenes, which are more like extended scenes from the film. If you enjoyed the movie, you’ll like the extra minutes here. 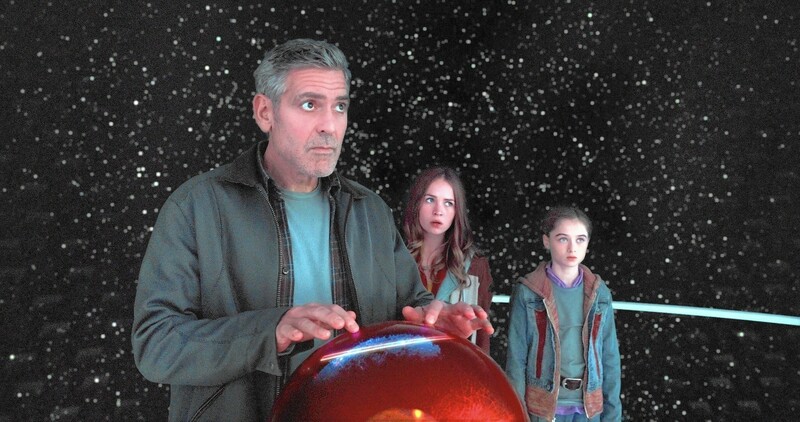 ‘Tomorrowland‘ isn’t the movie we all hoped it would be in the end, but it is very entertaining. I just wanted more from it. The pacing dragged here and there and some of the characters seemed a tiny bit deserted. Still, there is enough good here to satisfy, especially the younger ones. The video and audio presentations are top notch and demo worthy and the extras are very good and worth watching. This Blu-ray comes HIGHLY RECOMMENDED! This entry was posted on Thursday, October 15th, 2015 at 12:01 pm	and is filed under Film, News. You can follow any responses to this entry through the RSS 2.0 feed. You can skip to the end and leave a response. Pinging is currently not allowed. « Godzilla Comes Back To Big Screens & Brings King Kong Too!! !